Sewing has been annoyingly scarce but I have been able to squeeze in some crochet over the last two weeks. Taking photos has been pretty tricky too. I have made a shrug from a free pattern on Ravelry called the Custard shrug. It was a great travelling project and was mostly done on a three hour train ride to Barmouth in Wales last weekend. Staying with two small children in the same hotel room for the weekend affords a great deal of being-quiet-crochet-time while they got off to sleep for two evenings. There was of course the journey back too. We cycled the Mawddach cycle route from Barmouth to Dolgellau (in pouring rain) so we were very proud of big Sis who managed 9 miles on her bike. Little M sat waterproof in the bike trailer for the whole journey, lucky her! Between playing cards and picnicing on the train these rows worked up really quickly. You could add sleeves from the pattern but I wanted a small neat shrug. I finished the edge with a picot of three's. Three Double crochet and then 3 chains, slip stitched into the first chain, then repeated. If I made it again (which I will) I will make my shrug more snug! I was a bit generous with my back measurements when I started because I was using Cotton yarn and I knew it would have little give but the back is a touch loose. This is a great pattern based on you measurements not on your yarn so you can make it in whatever wool you have in whatever size you are - genius. I used, not quite, two balls of patons Cotton 4ply in navy blue; that is the colour of the moment for me right now. I am smiling because, you know, I am a half-glass-full kinda lady but it's not quite right somehow. I bought this Vogue 7042 1967 pattern in Whitby from a Vintage shop for just £1.50 but at Bust 38 it turns out to be a touch too big. The second 'mmmm' for me was my fabric choice. It is a linen cotton mix which I chose as my Minerva sponsored fabric this month. I have never done a negative review for any of the fabric I have had from them but it was just too darn crisp. I washed it before I used it too but it was still stiff. It wasn't the right fabric for this pattern... you could press the seams your thumb nail. On the plus side Minerva has a great choice of beautiful lining. This is called jacquard lining and is fantastic quality. I would buy this again definitely. I could then have a bash at my other vintage jacket pattern and choose a different coloured lining. This pattern is a 36 bust so should be a better starting point. Yeah! I really love the lining and I am sure the jacket will get a few summer try outs but it is not the denim jacket replacement I thought it would be. I learnt lots of new skills making this and most importantly, I learnt to take my time, follow the instructions and enjoy sewing. That is a good thing for me. 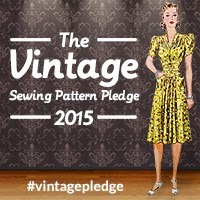 It is also one more make for my Vintage pledge this year over at Stitching Odyssey. I bought an espadrille kit, I thought it would be fun. Espadrilles always fall off my feet at the back when I try them on. I got a hole in my finger hand sewing. I don't know why I thought going to the massive effort to make them would mean that they wouldn't slip off the backs of my feet - which they did. So I took the backs off and now I have new slippers. I'm happy now! I have had some quite hefty knitting projects on the go of late and wanted to lighten the load but keep my hands busy. I continued to use up the rest of the scraps I gave Big Sis for her crochet blanket exploits. All the odd colours of yarn were leftover but I thought I would give kitsch-crochet a go and see what happened. The back is double crochet stripy with a button flap. The bobbles were just what I wanted to finish it off. Now that was and is some happy crochet. Enjoy your weekend, we are off on a mammoth bike ride this weekend. Thank you so much for your kind wishes for Little M she is on the mend now with a fairly unrecognisable thumb. We managed a few days out over the last week as we were in the mid holiday dip that so often happens. We went to the butterfly farm at Stratford and everyone really enjoyed it. Then we managed a trip to Cardingmill Valley in the Shropshire Hills, a stunning part of Shropshire only 25 mins from our house. Time was spent catching fish in a bucket and collecting stones. I squeezed in a little crochet after I had taught them how to tickle stickleback fish. You can give a girl fish but teach them to catch their own and they leave you alone for a considerable amount of time to crochet I found. Sounds like a proverb to me. Also still enjoying crafty time with the girls. We have been getting stuck into their Christmas and birthday gift craft kits. (some activities pre-injury) I am finding that they have more WIPS than me and they sort of feel like mine too in a way because I have to help them along but I do love doing it with them. Just snippets of holiday news today. I have managed to fit a little crochet into teeny snippets of the summer holidays. These crochet collars were rather easy. The pattern is by Nicki Trench from an old copy of crochet inside (originally from Geek chic crochet I think) but I made it smaller to avoid looking too victorian. I think they have turned something rather simple into something quite special. I have had a a hard mothering week. Short version: Little M shut her thumb in the back door on Sunday, A&E at two hospitals, open thumb fracture, flipped thumb nail etc. Culminating in surgery yesterday to make a template of her thumb nail and... reinsert it into the nail bed. It is indeed as gory as it sounds. So crafting has been low on the agenda. I was actually grateful to go to work on Tuesday to eat my dinner uninterrupted and have a wee on my own! Annywayyy....I still have posts written from last week when we got back from holiday so I am tripping those out this week. Hence girls playing in dollhouses without injury to themselves on Wednesday! Crafting News from last week:I bought a Clover quilting template set on holiday. I was in a dinky haberdashery in Louth and I didn't want to purchase anymore fabric, although it was all fabulous, my mind thought of the patchwork box that was already overflowing at home. I started cutting out... I did't know what it was going to be. I like that feeling, the absolute randomness of just starting something with no outcome, it is so liberating to me and my creative brain. I made 8 sets of 8 diamonds and 8 sets of 8 triangles. I also filled a jar with the smallest triangles and squares. I wonder where it will all lead to? What it will be? and how long it will take? Thanks for stopping by and especially for all your dollhouse memories, they made me smile after an exhausting day at the hospital. We live in a three story house, it keeps me fit and names my blog! Today I am giving you a peek into our other two three story houses. After our holidays the girls came back with little stripy paper bags of presents bought for them by their kind and generous Aunt and Uncle: a little dog, a wall cupboard and a fruit bowl. I have not shared with you the wonders of their dollhouse collections but their choice of play yesterday made me write up a little post. My Uncle made the first house for Big Sis when she was one and she has collected things for it ever since. Spending her birthday money on little plates and cups, pictures and flowers. My brother-in-law made the second one for Little M after I bought it in a kit. She also likes to visit the market stall that sells little treasures for her house. They both always have something from Father Christmas to go in their houses every year too. Yesterday they decided to do a spring clean and take everything out and give it a dust; playing with a dry paintbrush and sweeping the carpets with an old toothbrush really. They were chatting away about what they had and where they were going to put things afterwards. Do you want a little peek inside them? We also made a little repair pile of things that had got a little damaged. A good holiday job to cross off the list. What about a few close ups? I would never have bought them Dollhouses but the influence of my family members has really grown on me over time. I have made them miniature crochet items which they use as a bath rug here and hand towels in the other one. Big Sis used her first piece of double crochet as a bed spread and modelled this room on our spare room hence the sewing corner. Do you know anyone with a dollhouse? Did the you enjoy that little three story tour?